In my own case series, 82% of the patients were male; 18% were female. At presentation, the average age was 49 years (range, 21 to 75 years). The largest group was in the 40 - to 59 years-old age bracket. At follow up, three months to two years after the procedure, patients were requested to complete a questionnaire. The questionnaire assessed subjective outcome measures. Items included postoperative course, reduction in snoring (scaled), energy level, quality of sleep and partner satisfaction. In this series, 79% of the patients reported a worthwhile moderate or greater reduction or cure of their snoring problem. 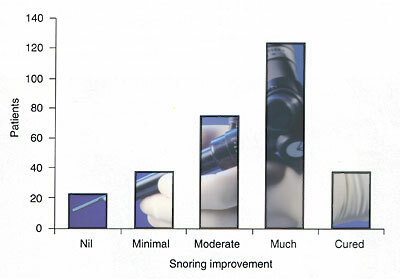 Two hundred and six patients (69%) stated that they slept better and were less tired as a result of the snoring surgery. Of the sleeping partners, 70% declared they were happy with the result.